Hermann, Mo. 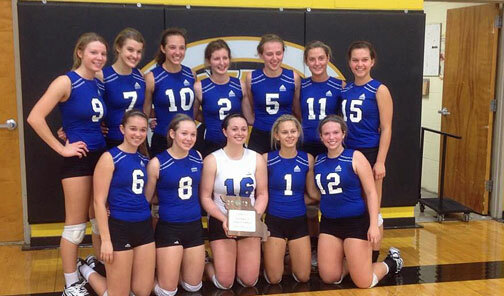 - The Hermann Lady Bearcats (21-13) won their eighth straight District Championship Tuesday night at Cuba High School by knocking off Dixon (21-6-1) in straight sets 25-14, 25-22, advancing into Saturday’s State Sectionals. Suffering from tendinitis in her shoulder, Jamie Glesson had not been swinging at balls during practice. This did not keep the Hermann senior from spiking 10 kills and serving four aces in their two set win over Cuba in the District Semifinals. Glesson turned right around in the District Championship match to lead her team with 8 kills and 3 blocks. “I thought we came out strong in the first game. Dixon had two really good left side hitters and there wasn’t much mystery about what they were going to do with the ball,” said Coach Linda Lampkin. Hermann’s dominating front row disrupted Dixon’s offense. “We started off really strong blocking both of Dixon’s big hitters, forcing them to make adjustments,” Lampkin said. The second game was a different story Coach Lampkin explained, “I felt we were still playing very well but they started playing better. Their back row defenders started digging everything we’d throw at them”, but the Lady Bearcats were able to fend off Dixon, giving Coach Lampkin her 29th career District Championship. Hermann is near unbeatable on their own court. When playing at home this year Hermann is 11-2 as they will host Saturday’s Sectional play, which will feature the defending Class 2 State Champions, Fatima. 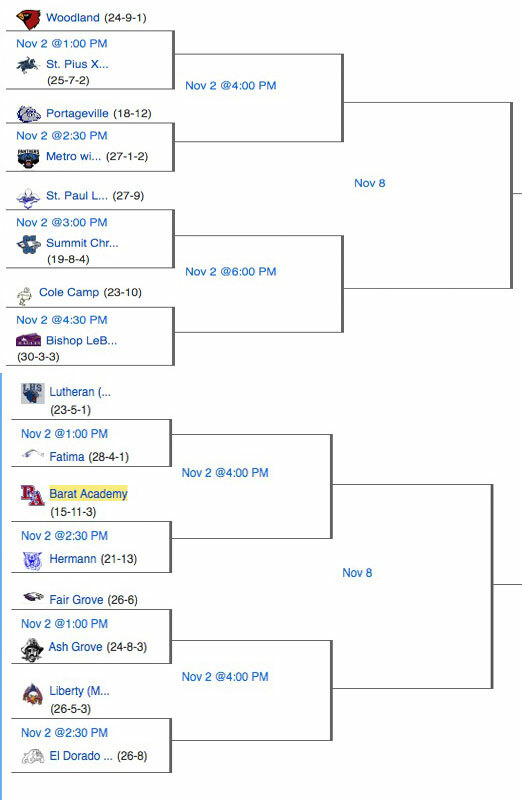 Fatima (28-4-1) and Lutheran St. Charles (23-5-1) will play in the first game on Saturday at Hermann at 1 p.m. The Lady Bearcats will take on Barat Academy (15-11-3) at 2:15 p.m. The winners in each match will then battle at a scheduled start time of 4 p.m. where one team will advance into the Final Four in Cape Girardeau at the Show-Me Center. Below is the Class 2 Volleyball State Championship Bracket.